Sharing our cat rescue story always warms my heart. Stewie has become an integral part of this family. Without him we wouldn’t laugh as much, smile as much, or have such great relationships with each other. I acknowledge that Purina Cat Chow is partnering with me to participate in its ‘Nutrition to Build Better Lives’ program. As a part of the Program, I am receiving compensation in the form of products and services for the purpose of promoting Purina Cat Chow. All expressed opinions and experiences are my own words. My post complies with the Word Of Mouth Marketing Association (WOMMA) Ethics Code and applicable Federal Trade Commission guidelines. Stewie and two other cats were left locked in a house. Their family abandoned them. After finding two of three, we had them vetted and took them home. (The third was later found and placed in a no-kill shelter.) Everyone in our family immediately fell in love with Stewie’s personality. He’s super social, loves affection, and behaves a lot more like a dog than a cat. If someone comes to the door, he runs to see who it is and greets them with a meow and soft paws. The other cat, who we named Brian, wasn’t a great fit for our (young at the time) family. He was always terrified of the kids and hiding some place impossible to reach. As fate would have it, a friend of mine, Brian (human), knew Brian (the cat) was meant to be his best friend. They’re happy couch potatoes in the city now. Stewie is going to be 12 this year, and we’ve had him for about 6 of those years. He’s our best friend. His antics are always cracking us up. Getting to know him has been an absolute joy. During these past six years, we’ve noticed Stewie fitting into several different profiles. For example, he can often be found yearning to get outside, pathetically meowing at the window. Then, once outside, the look of sheer panic on his face is hilarious. 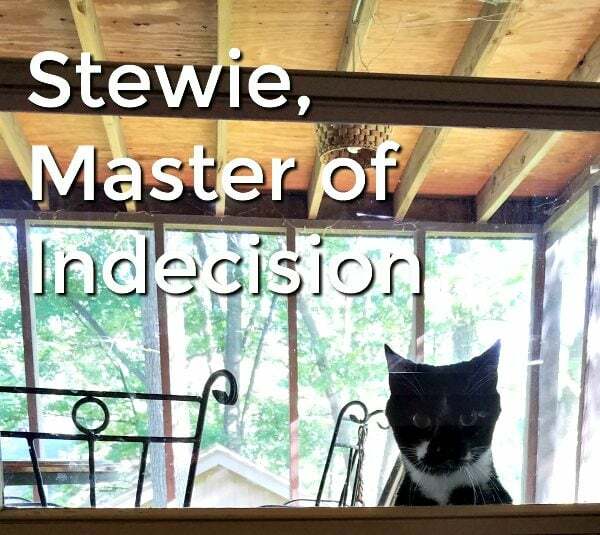 Hence, the title: Stewie, Master of Indecision. This brings me to the coolest thing Purina is doing. During the month of July when you buy Purina Cat Chow for your cat (any size bag), Purina will donate a meal to cats in shelters. Their goal is to reach 5,000,000 meals donated! We only have until July 31st, 2016 so stock up on your Purina Cat Chow! Each year, approximately 3.4 million cats in the United States are taken in by animal shelters and only half of those cats are adopted. Think of all those sad kitties that never know a family. It’s a horrendous tragedy. If I could, I’d take in 10 more playful felines. This year, Purina Cat Chow is focused on delivering excellent nutrition to cats in the care of animal welfare organizations to help them become healthy and ready for their forever homes with its “Nutrition to Build Better Lives” program. Stock up on Purina Cat Chow! Do you have a cat rescue story in your family? What a great cause. Your kitty is beautiful. We adopted a kitten about a year ago and she is a big part of our family. We love her so much. He’s adorable!! My cats are rescues too. He’s so lucky to have found you! The video of Stewie is wonderful! He is a cutie and I am so happy you rescued him. I love stories like that! We rescued a kitty too and it is a good feeling. Stewie is very cute and I am glad that you have had him for so long and were able to find a place for your other cat. Aww. Stewie is so cute! I rescued all my cats, too. In fact, I think rescues are the best. 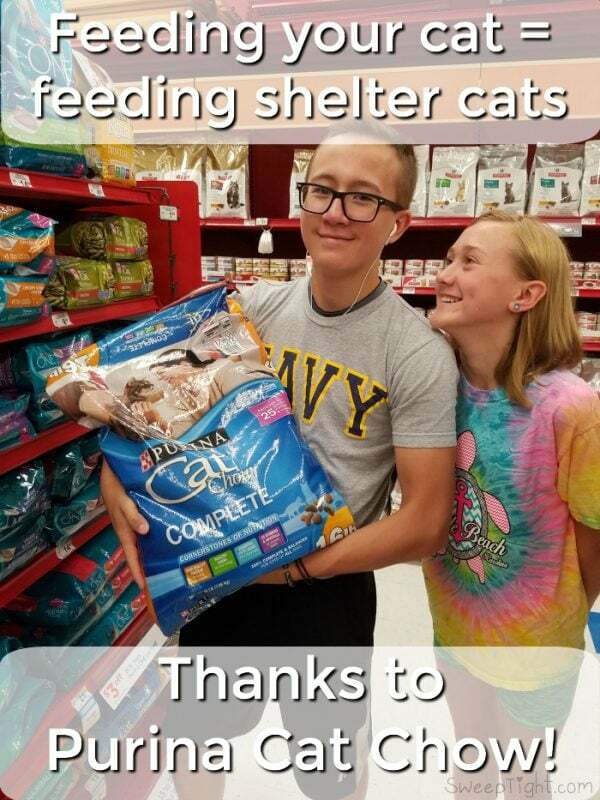 I’m glad Purina is helping shelter cats have better lives. What an adorable kitty. Stewie sounds like he has quite the personalty. Loved watching the video, super funny! My husband is allergic to cats, so our rescue cat went to live with my mom. She named the abandoned kitten Muffin, and she’s feisty! My mom’s thrilled to have her & tries to provide the best for her. Rescue animals make the best pets!! Stewie is adorable, he looks like he could entertain everyone for hours! What a great video. If cats have nine lives, it makes sense that they also have nine personalities. This is a wonderful video. 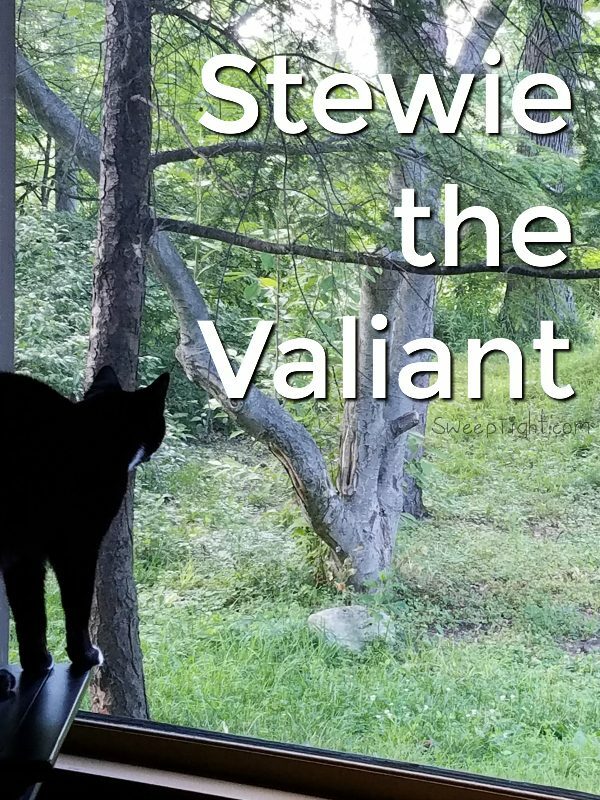 It is important to help rescue cats like Stewie. I am so glad you were able to rescue Stewie and give him a great life. Cheers to another 12 or more years with him! I miss having a cat. Have to see about a rescue cat. I’ve got two rescued cats that we’ve had 21 years now. Their mother brought them to me shortly after they were born. I was making soup and she must have smelled it. We kept her and two of her three kittens (we gave one away). Just love them to pieces!! Stewie is my life. We snuggle all of the time and he always gets angry if I don’t feed him. But he is the best.